The Shop Of Choice For The Millennium! 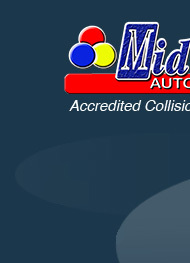 Mid Island Collision represents the Highest Standards of quality workmanship in the automotive industry today. Using the latest techniques and cutting edge equipment, we are the only facility in Nanaimo to feature BSAF solid gold paint technology. This allows us to precision match the color of your vehicle for a perfect factory finish. The overall benefit to you, our customer, is superior quality and expert repair supported by a lifetime guarantee. We specialize in all types of autobody damage repair including frame straightening, custom and/or exact colour match, collision repairs, scratch and dent repair and all other results of crashes, scrapes, collisions etc... Courtesy cars are available for your use throughout the repair. We have experience with all makes and models of cars, trucks, sport utility vehicles and light trucks. From BMW to Mercedez, Dodge to Mazda, we care about your automobile and will always treat you fairly and with respect.